At the outbreak of war in August 1914, the means of transporting the sick and wounded had advanced little since the Boer War some twelve years previous. They were still using horse drawn ambulance wagons and nurses were sent on horseback to tend to the wounded when the ambulance was too slow. The earliest weeks of the war shattered any illusion this could continue and motorised ambulances quickly replaced the horse drawn wagon across the Western Front. 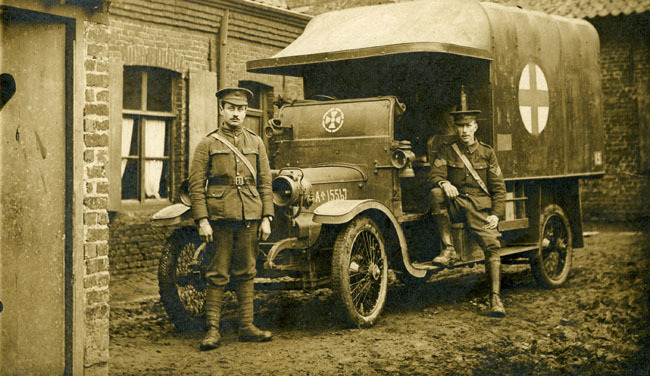 Ambulance drivers like Violet Tillson and Mem Custance were on the front lines of the Western Front helping wounded soldiers at Ypres, The Somme and Verdun.